Over time your teeth can change in shade, becoming yellow and discoloured. This can come about simply from aging, or it can develop due to diet or other habits. Regardless of the reason, Toronto area patients don’t have to tolerate discoloured teeth. We are happy to provide our patients with teeth whitening treatments, that result in a brighter, healthier looking smile in as little as one office visit. We talk with many patients who find themselves smiling less because they are self-conscious about their tooth discolouration. Their teeth may have become yellowed by coffee or wine, or maybe even from smoking. With teeth whitening, we can reverse any staining left on your teeth, making them many shades whiter. 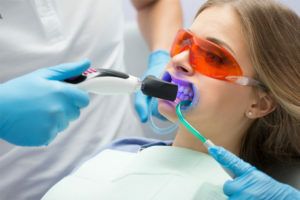 Who Qualifies for Teeth Whitening? Young: It is typically recommended that children and teenagers do not receive teeth whitening. If you are unsure whether or not your child can or should receive teeth whitening, then you will need to speak with their pediatric dentist. Pregnant: Generally, pregnant women are advised against seeking any kind of cosmetic treatment. Schedule your whitening appointment for after your due date. Previously Restored: Most restorations are made from porcelain and zirconia, which are both materials resistant to staining and, as a result, whitening. This means if you have had treatments like dental implants, veneers, and crowns, whitening will have no impact on your previously restored teeth. Allergic: The main ingredient used in teeth whitening solutions is peroxide. 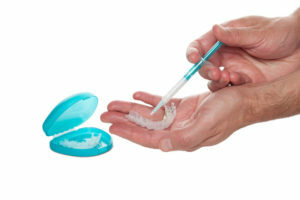 If you have an allergy to this substance, then teeth whitening simply will not work for you. For potential alternatives, contact our practice and speak with Dr. Hughes, Dr. Mojdami or Dr. Cakmakci. Teeth whitening is a popular cosmetic treatment because of how quickly patients see results. This makes it preferable for patients who would like to look their best at an important life event coming up, like a business conference or a wedding. Our team of qualified doctors can provide an in-office process that will leave patients with a smile shades whiter in just one visit. Our in-office solution is very simple and takes only about 90 minutes to complete. When you come into our office, we’ll quickly check your teeth and gums to make sure that they are healthy enough for teeth whitening. Once you are pre-screened, we will put protective measures in place to ensure that only your teeth are affected by the whitening solution. The solution will be applied to your teeth once your mouth is suitably protected. To activate the solution, you will be placed in front of a special light. You can expect to participate in four sessions at 15 minutes each to achieve the beautiful white smile you’ve always wanted. All you have to do is go out and show off that brilliant smile. We also offer a variety of options that can help you achieve a brighter smile from the comfort of your home. Our at-home options include custom-made mouth trays, which will fit snuggly around your teeth and a whitening solution, which is applied to these mouth trays, and then worn for a period of 1 to 3 hours. Patients are advised to continue treatments once a day for between one and three weeks to three weeks. Patients can expect to see improvements with each treatment. If you would like more information about teeth whitening, or would like to find out which treatment option bests fits your needs, then contact our office and schedule a no-obligation consultation with Dr. Andre Hughes. We look forward to hearing from you soon!